According to the story, Newton discovered the Law of Universal Gravity after watching an apple fall from a tree on his country estate. Gravity is the force that pulls the apple toward the earth and causes it to fall. It also acts on the moon to hold it in its orbit. Having discovered gravity, Newton understood that there was a force acting on the apple; now he wanted to understand the apple’s trajectory as it falls, that is, he wanted to know the position function for a falling apple. First, he needed to know how the force of gravity affects the apple's trajectory, and to this end he discovered the Second Law of Motion (after discovering the First Law of Motion), which is force (F) equals mass (M) times acceleration (A), or F = M * A.
v(t) = -10 * t + V0 where V0 is the apple’s initial velocity. The solution for V0 = 0 is shown graphed to the left. Can we solve this DE right now? 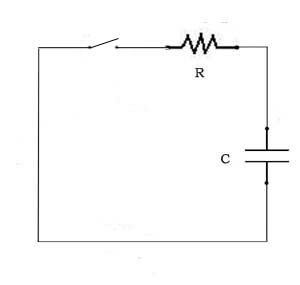 Ans: no, solving this DE will occupy us for the remainder of Volume 2. We can’t write the exact solution to p’(t) = -10 * t + 0, but we can graph an approximate solution. 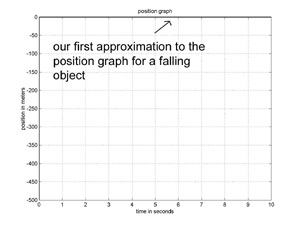 Suppose we want to graph the first 10 seconds of the apple’s fall. We will draw a graph made up of straight line segments (and called piecewise linear) to approximate the apple’s position function. How to do it? We'll start with a single segment for the entire 10 seconds. 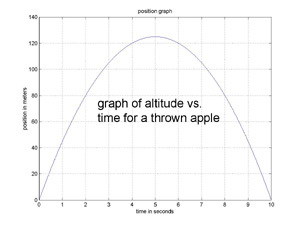 The apple’s starting altitude is 0, so, now, all we need is the slope of the line. 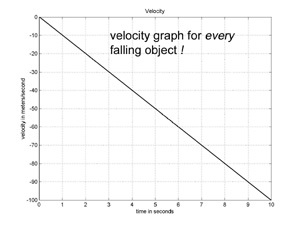 We know the apple’s velocity at time t = 0 is 0 (m/sec), and its velocity at time t=10 is –100. So, we could use an ‘average’ velocity, but, let’s do the least amount of work possible, and just use the velocity at the start of the interval, v(0) = 0, so that our first approximation is a horizontal line at altitude 0. This gives us the linear graph shown to the left. A lousy approximation to the true trajectory of a falling apple, but, hey, we're just getting started. Now, notice what happens when we divide the 10 seconds into two 5 second intervals and use a linear approximation for each subinterval. 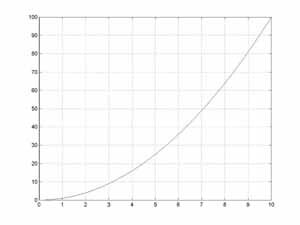 We get the same graph for the first 5 seconds. 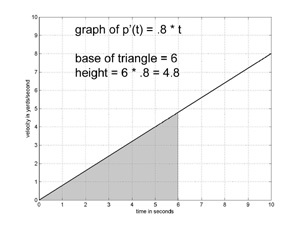 At t=5 our approximate solution is still at altitude 0, so the solution for the second interval starts at 0, and the slope of the solution is given by the velocity at the start of the second 5 seconds, which is v(5) = -50, giving the piecewise linear graph to the left. Not a good approximation, but a lot better than our first one. If we divide the 10 seconds into 10 one second intervals, and follow the method used above to produce a linear approximation for each subinterval, we get the graph to the left. This is a pretty good approximation to the true solution to the DE. Compare it to the exact solution below. This is the technique engineers most often use to solve differential equations! It’s just this simple, and it can be used to obtain a solution to any DE. In Volume 1, we learned that the velocity function for p(t) = V * t + P0 is p’(t) = V. We were a bit cavalier there, not really bothering with definitions, and when velocity is not constant we need to be more careful. The velocity function p’(t) calculates the runner’s velocity at the instant when time equals t – what does that mean? Here is the problem: the formula that calculates velocity for the interval t1 to t2 is velocity = distance / (t2 – t1). This formula is more than a way of calculating velocity, it is the definition of velocity. And, it works fine for intervals, but not for instants. Why not? For an instant at time t, t1 = t and t2 = t, so, the formula becomes distance / (t2 – t1) = 0/0. This is a bit of a sticky wicket. As h becomes smaller, the approximation improves, and the velocity for the interval approaches 2*4. We define the instantaneous velocity of any function at time t to be the limit of the velocity for a interval of length h starting at time t, as h approaches 0. So, we see that p’(4) = 2*4 = 8. That's the crux of calculus right there, folks. The area corresponding to the integral is shown shaded in the figure below. We will evaluate the integral geometrically. The formula for the area of a triangle is one-half the base times the height. The area under the graph of A*t for the interval 0 to t2 is (1/2) * t2 * (A* t2) = A* t22 / 2. 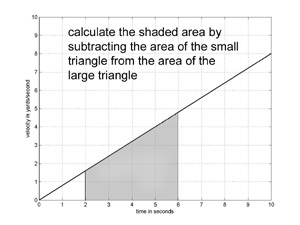 We can calculate the area under the graph for the interval t1 to t2 by subtracting the area of the smaller triangle from the area of the larger triangle, giving A* t22 / 2 – A* t12 / 2. The calculation above shows that the FTOC is true when p(t) = A*t2 / 2 and p'(t) = A*t.
We can differentiate p(t) = A*t2/2 + V0*t + P0 by adding the derivatives of each term, giving p’(t) = A*t + V0 + 0. Then, differentiating p’(t) gives p’’(t) = A. So, if A = -10, then apparently p(t) is a solution to the DE p’’(t) = -10 for every value of P0 and every value of V0. Thus we have solved the DE that characterizes the trajectory of a falling object, that is p’’(t) = -10. The method used was 'by inspection', that is, we looked at the DE and recognized that we could immediately write down a solution. The initial position of the trajectory defined by p(t) = A*t2/2 + V0*t + P0 is p(0) = P0 and the initial velocity is p'(0) = V0. We can choose these constants to fit the physical system being modeled as shown below. 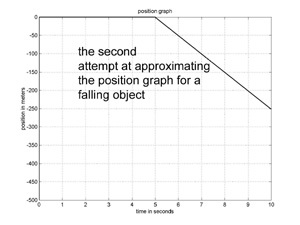 If an apple is thrown upwards from an initial altitude of 0 meters, with an initial upward velocity of 50 meters/sec, then P0 = 0, V0 = 50, and its trajectory is given by p(t) = -5*t2 + 50*t + 0. Air resistance opposes the flight of any object near the earth, and is proportional to the square of the velocity. 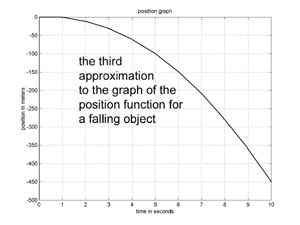 If we include drag in the differential equation for the trajectory of a falling apple we have A – D* p’(t) * p’(t) = p’’(t) where D is the ‘drag coefficient’ of the apple. This DE is difficult to solve analytically (that is, with a mathematical expression for p), however, we can easily determine a graphical solution using the method of piecewise linear approximation discussed above (as shown in the book). We can analyze electrical components and simple circuits just by changing the names of the functions, the math is the same. 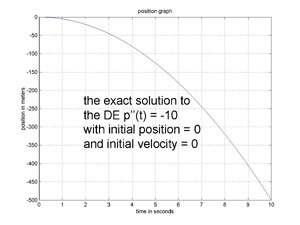 An innocuous enough looking DE, but the solution requires the exponential function (one of nature's favorites), so an analytical solution is deferred to Vol. 3. The important thing is to see how DE's are used to model physical systems, and we do compute numerical solutions, using the method of Chapter 2, for various simple circuits.